A 1948 Gibson L-5P sold for 82,960 US dollars, well above its pre-sale estimate of 20,000 to 30,000 US dollars. And a replica of a prized Clapton guitar that duplicates the cigarette burns and belt buckle scratches found on the original sold for 30,500 US dollars at the auction. The sale at Bonhams New York included 75 guitars and 55 amps from the British artist's collection and brought in 2.15 million US dollars. Proceeds were to benefit a drug and alcohol treatment centre Clapton founded in the Caribbean. The 65-year-old Rock and Roll Hall of Famer is a recovered addict who established the non-profit Crossroads Centre in Antigua in 1998. 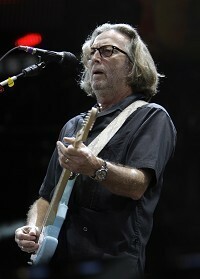 The replica Fender Stratocaster Blackie guitar is inscribed in silver felt pen with Eric Clapton 2010. The original Blackie sold at Christie's in 2004 for 959,500 US dollars. It was the most expensive guitar ever to be sold at auction, said Bonhams' expert, Carey Wallace. The Los Angeles-based Guitar Centre bought it. Other Clapton guitars sold even better than the Blackie replica. An original custom-made black Fender Eric Clapton signature Stratocaster sold for 51,240 US dollars, including the buyer's premium. It had been used during the Cream Reunion Shows in New York and London in 2005. Its pre-sale estimate was 20,000 to 30,000 US dollars. The amp with the loudest sale price was a pair of 1997 Fender Twin Amps, estimated at 9,000 to 12,000 US dollars. They sold for a booming 42,700 US dollars.